I am about to commit my own personal cardinal sin – a blog without photos. I did take some – I’ll try to go back and put some in! Last Saturday, September 10th, we had two-thirds of the Riverfrontiers descend upon us for our first rehearsal of the 2016-2017 season. This is Riverfront’s FOURTEENTH season, and these students were chomping at the bit to get started. We have 36 Seniors this fall, which is the biggest group we’ve had in several years – and about as big as we can contemplate getting, if we don’t want to have a dozen people acting as trees. It’s HARD to find or write plays big enough to keep that many people busy – especially straight plays! Only four of our Seniors are new, although our numbers have gone up by 8 this year – the rest have returned after a season or two away, or have “graduated” from the Junior Ensemble. Speaking of the plays, we barely touched on ice breakers, since the general shrieking and hugging convinced us that our student body was composed almost entirely of returning students, who were already readily embracing our few newcomers. After a quick refresher on our rules, policies and expectations, we dove in. 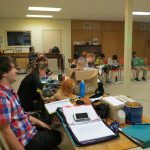 Handing out all the scripts, we started the read-through for our first upcoming Senior production, another original Riverfront adaptation, Narnia: The Early Chronicles, which will be performed at The Olde Walkerville Theatre during the last week of February 2017. Narnia: The Early Chronicles is a blend of two of C.S. Lewis’s novels – The Lion, The Witch and the Wardrobe, and The Magician’s Nephew, which he wrote later, and which provides some key background information on how Narnia was created, where the White Witch came from, and how Narnia came to be connected with our world. 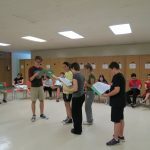 Using both novels allowed us to expand the cast list for our seniors, and give the audience a much deeper and more exciting story to really pull them into the world of Narnia. The adaptation was written over the summer by Julian David and Kristina Garswood. I was so excited to see our new people diving right in and volunteering to read. Everyone seemed eager to make a start, with not too many holding back – and we’ll get them moving this week. When a much-needed stretch break was needed, our Music Director, Jeff, came to the rescue with some rhythm exercises and games, while the rest of the crew grabbed a quick pow-wow on proceedings so far. 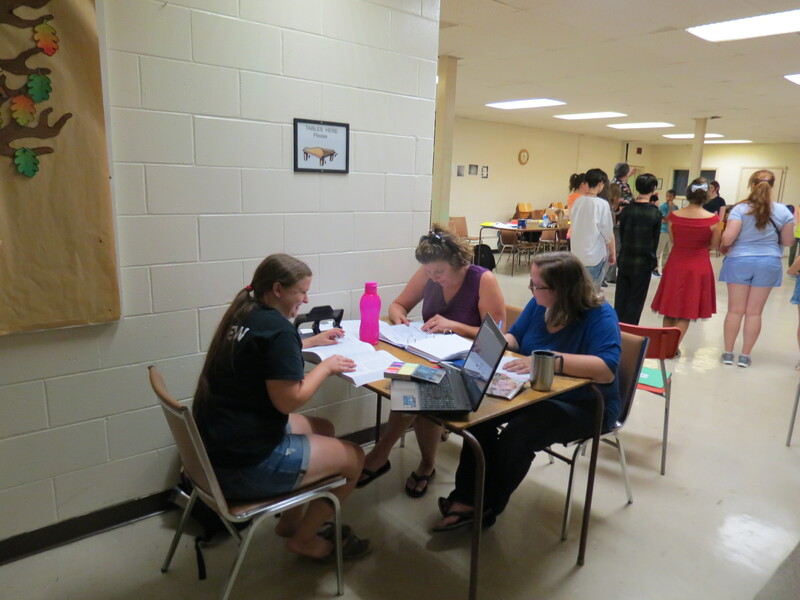 Meanwhile, the registration crew was hard at work, sorting out all the new registration forms and lining up the information I’ll need with my working student binder. Many thanks to Meaghan and Nicole for taking that on! We had a production meeting at lunch to talk about what we need to line up for Narnia, and to discuss some strategy and budget needs for our tech. There was a vigorous debate about how some of our costuming will go for some of these characters, and I’m looking forward to seeing what creative minds and hands come up with! After lunch, it was back to the script, and a drama game. I was pleased and impressed that we finished a read-through of all of Act one! 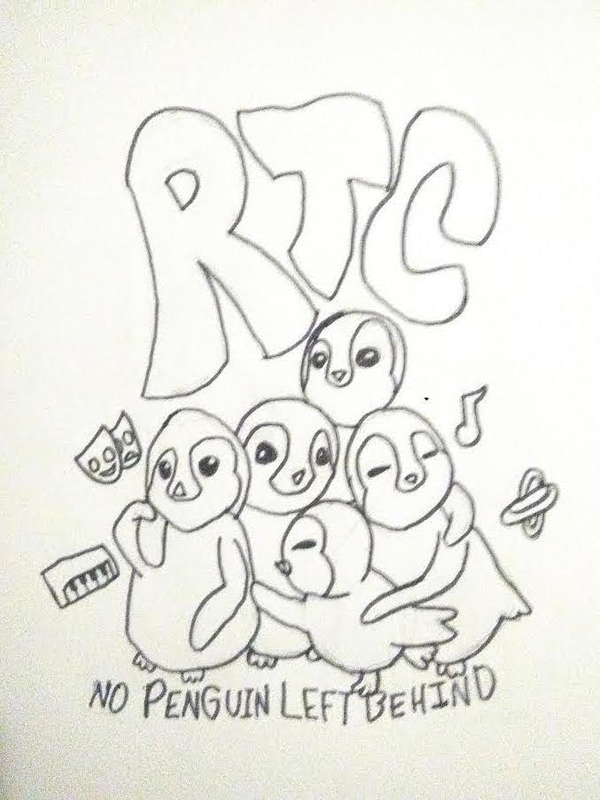 At the very end of the day, we chose, by secret ballot, the winning design for the front of our tshirts this season. Congratulations to Anne Garant for her win, and thanks to all who participated! Good work by all! Tomorrow, the Seniors will read-through the rest of the play and get in a few more ice-breaking character game work. That will lead us to Saturday, the 24th, when the cast will be set for Narnia: The Early Chronicles. Once again, as we did with Pride and Prejudice, we’ll be working with Consensus Casting, which means that for the most part, the kids themselves are selecting the cast, based on their own self-assessment sheets during the three-week audition and read-through process. They gave us a fabulous cast for Pride and Prejudice, and we have ever confidence in them to do so again this season! Tomorrow, September 16th, will mark the first day of rehearsal for our twenty Juniors. With twenty of them, falling between the ages of 6 and 10, we’re going to have our hands full, pulling together their show, The Best Christmas Pageant Ever, which will be performed December 17th and 18th at Paulin Memorial Church, with admission by donation to support the programme. Only five of our Junior students are new to us this year, because again, most of our students from last season are still with us. We worked hard to squeeze in everyone who had been on our waiting list from last year, but to our dismay, we already have a waiting list of roughly a dozen students again for next year. 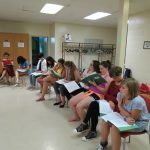 We all wish we could take everyone, but we are already stuffed to the gills, and want to make sure that the kids we do take all have something at least a little busy to do in the shows, and engaged in rehearsals. Our turnover is slender, which tells us that the programme is working well, and the kids are glad to be there! Please stay tuned for upcoming news as our season progresses! We do like to keep the blogs rolling! Previous: Previous post: A HUGE Thanks to Fulger Transport Inc.
Next: Next post: The Big Jam – and TWO Casts Selected!